Rats and mice are looking for shelter in and around buildings now that the bad weather has started. 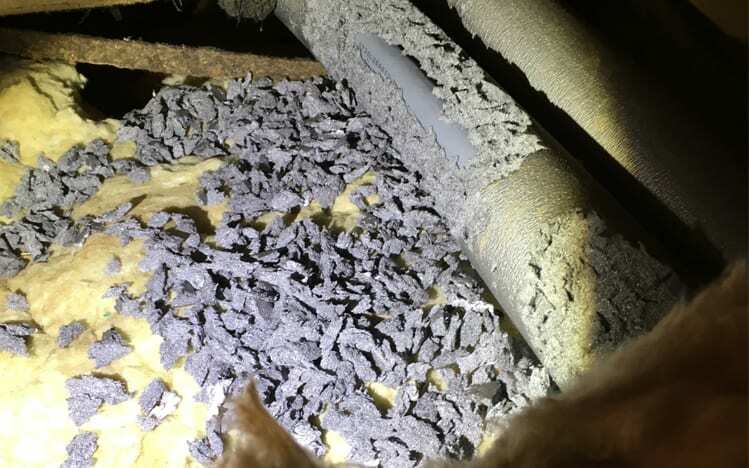 Rats and mice can cause a lot of damage inside houses and buildings: look at the chewed insulation around the pipe in the picture. All that damage was done by tiny mice so just imagine the damage that a much bigger rat could do! Even worse, the vermin will chew the water pipe as well: we have been to several properties flooded out by water pipes damaged by mice in the attic. It is a good job that this customer heard noises in the attic and called us in quickly for mouse control in his house. Rats and mice aren’t fussy – they’ll chew anything they come across to see if it is edible; under-floor heating pipes, dishwasher and washing machine hoses and electric cables are all at risk. Again, chewing at things like this could cause serious, structural damage to a property. You might find your Christmas decorations have been chewed by mice in the attic, maybe carrier bags by mice in the kitchen cupboards or bird feed by rats and mice in the garage or shed. Very often the vermin get lucky as one customer discovered last weekend: they got home from holiday and found that rats had eaten all the chocolate Christmas presents stacked on the bedroom floor – yuk! We sorted out that problem quickly with rat control. Unfortunately the vermin will keep wanting to move in for shelter until spring so problems with rat and mouse infestations in the house or building can last for several months. We provide rat and mouse control for infestations and can help prevent the rat and mouse problems in the longer-term with preventative baiting and rat and mouse proofing. Don’t ignore signs of a rat or mouse infestation – it is always best to act quickly to get rid of rats and mice and keep your house or building safe and sound and clear of vermin. If you suspect you have a rat or mouse problem or need rat or mouse control then ring us for advice.